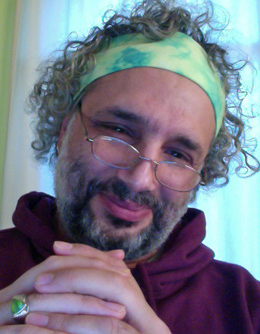 A different kind of photo than the ones we usually use -- my Jerry Garcia tribute, with tie dye by the Groovy Blueberry. As one of our Introductory Members on the new website, you get access to many features -- and you have the ability to comment on the work of our writers. I'm here to encourage you to participate -- that is, to add your thoughts to what our writers are saying to the world. Commenting in Planet Waves style means adding your response, whether on the level of feeling or thought, or expanding the conversation with a new idea. Comments are a vital part of our community discussion. I believe that your ideas are every bit as meaningful and necessary to share as are those of our writers, and I encourage you to speak up, be bold a say what is on your mind. It's helpful to add comments close to the subject in the original article, so that we keep the discussion focused. As an Introductory Member, you have access to the Monday Diary, the Daily Oracle, Inner Space horoscope, and the work of many other writers. We are still offering a handsomely discounted discount to Core Community Membership -- a modest fee for many, many professional astrological services you will come to depend on. Thanks for being a Planet Waves reader.